Vauxhall cars are at a crossroads. Now part of the French PSA Group, they are no longer reliant on their old parent company General Motors for engines & with the French knack of building economical but also drivable diesels, this should be good news for the Griffin. 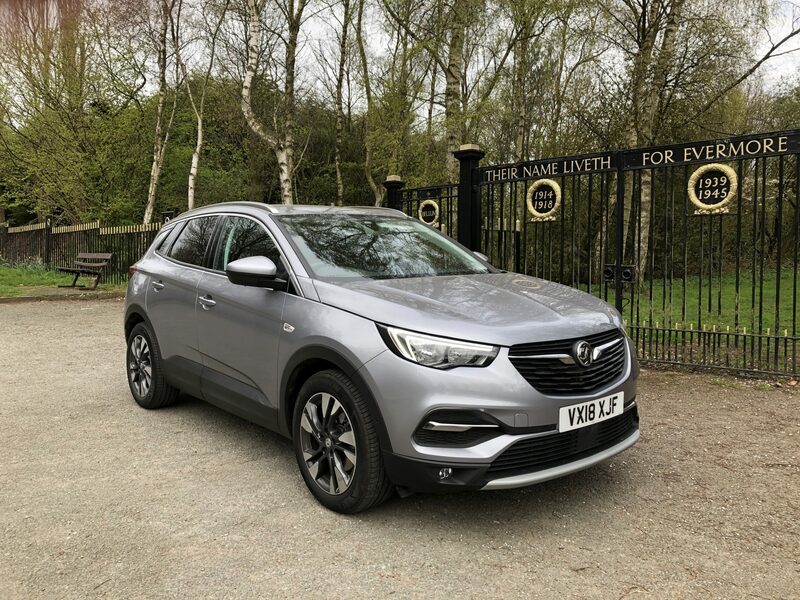 Mid-range SUV’s are now just about the most popular car sector in the UK, with Vauxhall launching their Qashqai competitor the Grandland X a couple of years ago. It’s a solid car but the 1.6 diesel engine fitted to the launch model was neither that frugal nor that powerful. The tie up with PSA means that this model is now available with a more modern PSA Group 1.5 diesel engine, also fitted to the Peugeot 3008, which CC&V got to try out recently. The Grandland X is one of three Vauxhall SUV’s, alongside the Mokka & Crossland X & to my mind, is the best looking of the bunch. It’s not as different to look at the Peugeot 508 or Citroen C5 Aircross, or as obvious as the Nissan Qashqai or Renault Kadjar, but is more akin to the Volkswagen Tiguan or SEAT Ateca. This means straighter lines & a more conservative shape. Inside, you’re met with a fairly uninspiring dashboard, with the centrally located 8″ colour touchscreen infotainment screen the standout. The quality & finish is very good & I have no doubt that it’s built to last. It’s just that the grey colour finish is a bit wishy-washy. Despite the washed out look, it all functions well. Thankfully the heating controls are separate to the touchscreen with our test model the Sport Nav, featuring dual-zone climate control. Also fitted was a Winter Pack which meant both front & rear heated seats, a real plus. Tech wise, the Vauxhall touchscreen, which gets you into the SatNav & media selection, is really straightforward to use. Connecting to Bluetooth takes just a few seconds & the bonus of Apple CarPlay meant that I could sync my iPhone to the system & utilise hands-free messaging. Standard equipment is generous on this model & includes voice control, a USB connection, cruise control, leather steering wheel, 18″ diamond cut alloys, electrically adjustable & foldable door mirrors, front & rear parking sensors, lane departure warning, side blind spot alert, plus a safety pack featuring a driver drowsiness system, automatic emergency braking, forward collision alert & lane assist. The cabin feels spacious. Both front seat passengers get good head & legroom whilst in the rear, thank to the almost flat floor, three adults will have decent leg room as well, plus with the high roof, six footers will enjoy the ride. Rear passengers also benefit from a fold own centre seat armrest with two cup holders that doubles as ski pass through. Door pockets are generous & there’s a couple of drinks holders in the centre cubby. 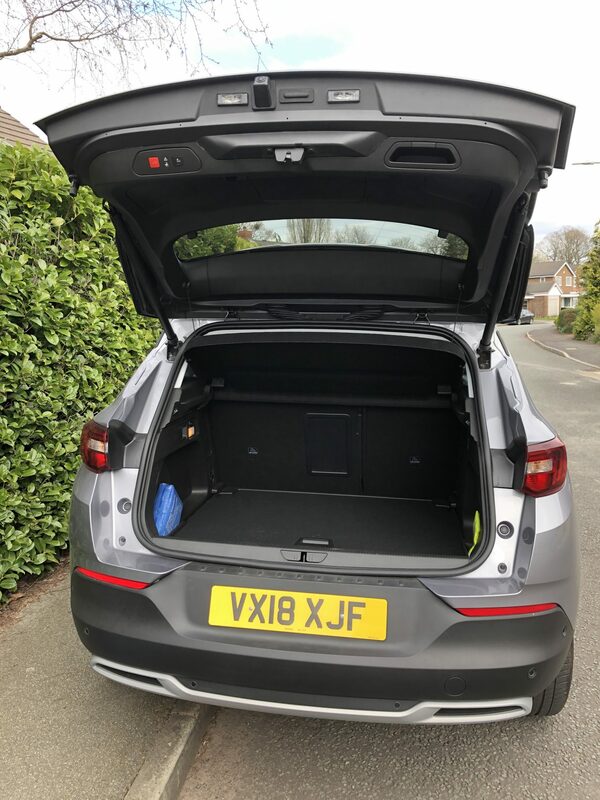 The glovebox is rubbish, offering little useful space & the USB connection in the front is hard tort each as well. Families will love the 513 litres on offer in the boot. There’s a flat floor for easy loading, that can be lowered or removed to increase the available space. Fold the 60:40 rear bench down & this goes up to a massive 1652 litres. I was able to fit my mountain bike in no trouble at all. The 1.5 diesel engine is a cracker. 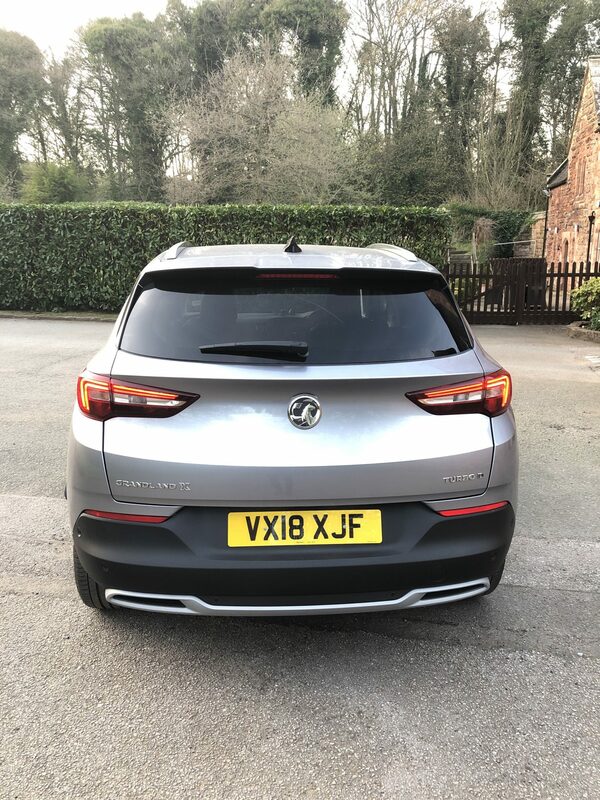 It won’t excite you, but what is does really well, with 130 PS on offer, is to pull the Grandland X along at a decent pace. There’s no diesel clatter, primarily because you don’t need to reach the high revs to get it going. It never feels stretched & with a 0-62mph time of 10.2 seconds, it’s comfortable & definitely not exciting. Outside noise in the cabin is minimal, even on our test cars 18″ wheels. The six speed gear box is a little stiff to engage, particularly from first to second. But, once into the higher gears, the Grandland X will happily go about it’s business. We spent a fair amount of time on the motorway & here too, it’s a happy performer. Engaging cruise control, we drove a couple of hundred miles on the M6, M56 & M53 during our week, averaging an excellent 57.6mpg. Vauxhall claim a combined figure of 63.7mpg, so even though our combined fell to 56.7mpg later in the week, I’d say that was pretty good. The 1.5 diesel engine offers up 113g/km of CO2 emissions. so coupled with the impressive fuel economy, the diesel Grandland X should be attractive to company car drivers. Take yourself onto some smaller country roads, which w idid around the Peckforton Hills near Chester & the Grandland X offers up plenty of grip with decent road manners. The suspension is quite Germanic, meaning it’s quite hard & this means that inside the cabin, you do feel some pot holed vibrations. Tight corners offer up some body roll, which adds an element of fun & I found it engaging as across country performer. After a week & a few hundred miles in the Grandland X fitted with the 1.5 diesel, I really had no major complaints. What it does really well, is to offer customers a really good all around package. 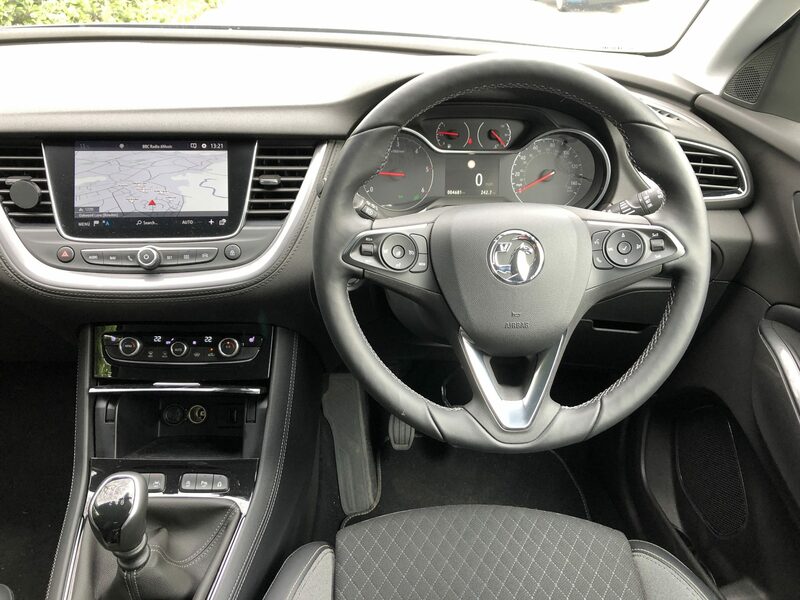 There’s loads of room in the cabin, plus good equipment levels, a comfortable interior, a spacious boot & Vauxhalls on trend tech. Combine this with the excellent fuel economy we achieved & it’s hard to fault. In Sport Nav spec it costs a pricey £27,730, so perhaps the cheaper SE, which is around £3000 less might be preferable. Whilst the SEAT Ateca is more fun to drive & the Peugeot 3008 more exciting visually both inside & out, don’t discount the Grandland X. I really liked it for what it offers, which is solid but not inspiring driving, brilliant practicality & highly respectable fuel economy. Could that be because it’s a diesel ? A happy go lucky 3.25/5.